This April, a new batch of Goshen College graduates will disperse to locations across the U.S. and the world. Yet every year, there is a group of students who choose to start their adult lives just blocks away from their alma mater. Kennan Bitikofer, a 2018 GC graduate from Manhattan, Kansas and Phillip Chan, a 2018 graduate from Zhuhai, China, have both found their first jobs only minutes away from the college. Bitikofer graduated with a major in computer science and now works at Studio Ace of Spades in downtown Goshen, in a building right beside Better World Books. Bitikofer said that he began thinking of what he wanted to do with his life his last semester of college. “I was monitoring Google alerts for jobs in the area and I found [an internship] position at Everence,” he said. As a programmer at Everence, Bitikofer was able to get a feel for professional work. “And they paid me, so that was nice,” he said. Upon reaching the end of his internship, Bitikofer sought out a different kind of experience in the local tech community. Peter Miller, a friend of Bitikofer’s and one of his former computer science professors, told him about the Studio Ace of Spades job. Chan, meanwhile, graduated from GC with a degree in physics and had dreamt of becoming an engineer. Yet despite enjoying his time at GC, Chan worried that he might not find an engineering job with only a four year degree under his belt. “That’s not usually enough for engineering,” he said. 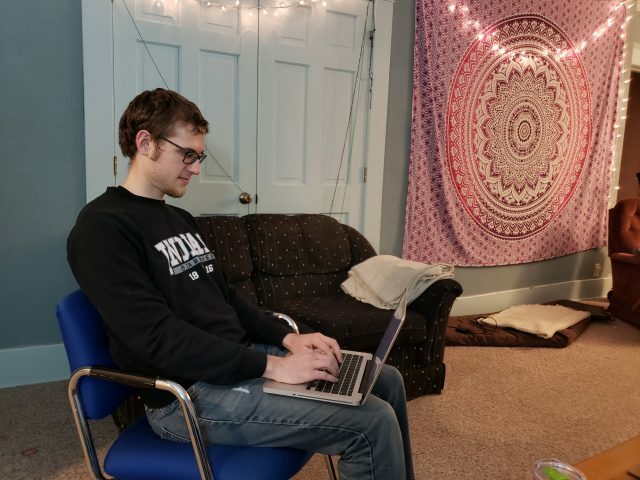 Chan considered going elsewhere to continue his career, but in February of 2018, Chan attended a job fair at the Lerner Theater in Elkhart, along with Nimoy Vaidya and Hajin Kim, both current seniors at GC. There, Chan caught the eye of Genesis Products, a local company that makes parts for RVs. Chan said that, although he didn’t have a full engineering degree, he had knowledge of specific programs that he would need for the job that set him apart. Before graduating, Chan spent a lot of time working with AutoCad, the same 3D design software he now uses as a product engineer at Genesis Products. Chan designs countertops for the RVs. “A customer will usually give us a design and what tools and how we’re going to make it. We have to do it according to the blueprints,” he said. For any given project, Chan will get 15 or so designs from the customer, and from there, it’s up to him. “I get to create a bunch of cool, weird designs,” said Chan. Over at Studio Ace of Spades, Bitikofer works developing a website for a company based in California. “The reason that I was hired was that they have a particular client: a company out in California that makes clickbait websites,” he said. In fact, the site that he is designing is home to such modern Internet staples as pop-up ads and personality quizzes. For Bitikofer, what makes his job so enjoyable is the work environment at Studio Ace of Spades. “We do some real quirky things,” he said. From regular Pokemon Go excursions to ping-pong matches, team bonding is never dull. The group works at an island of desks, arranged so that they all face each other. Bitikofer said that he has learned so much since starting his work in the field. “There was an enormous amount to learn when I went in. With any tech job, you never come in knowing everything,” said Bitikofer. Chan and Bitikofer agreed that it was nice to remain a part of the community that they spent their college years getting to know. The pair offered this advice to the next group of graduates. “If you want to go into a certain field, it’s good to have had a bunch of personal projects that you have involved in. If they see that you’ve been doing things for the pure enjoyment of doing them, that will make you stand out,” said Bitikofer. “Look for tools that you’re going to use and stuff that will make you different. It’s always good to stand out,” Chan said.